This summer has been overwhelmingly fashionable so far. The whole month of July in Miami was all about new fashion for the fall and spring of 2019. 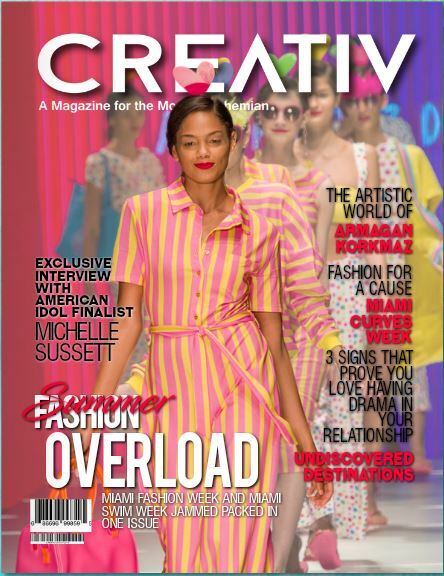 We had the privilege of covering Miami Fashion Week and Miami Swim Week this past month and we’ve realized the impact that creative minds have over our way of living. So much talent on the runway shaping the way we shop and create trends along the way. Moreover, the art world has given us new faces such as Josh Byer from Canada, Shakira Farrell from the USA and Armağan Korkmaz from Turkey. We just love having shone the light on artists around the world. We’ve had the opportunity to cover some community and charity events such as The Carma Foundation’s 11th Annual Geminis Give Back Event Honors NFL Champion and Hall of Famer Ray Lewis and International Recording artist Jason Derulo and the Miami Curves Fashion Week creating awareness around Heart Disease. In our featured designer segment, we get to know Jessica L. Taylor designer of JUST LIKE THAT FASHION, she has been in the game for quite some time now and seems like it’s not going to stop. Check her out on page 50. Discover our writer’s corner with relationship advice, new places to discover on your next trip and how to get involved in your community. We never cease to thank our contributors and writers who make these issues possible. Our dear readers, Ladies and gentlemen, artists of all ages, I present to you our 27th issue. Enjoy !! !